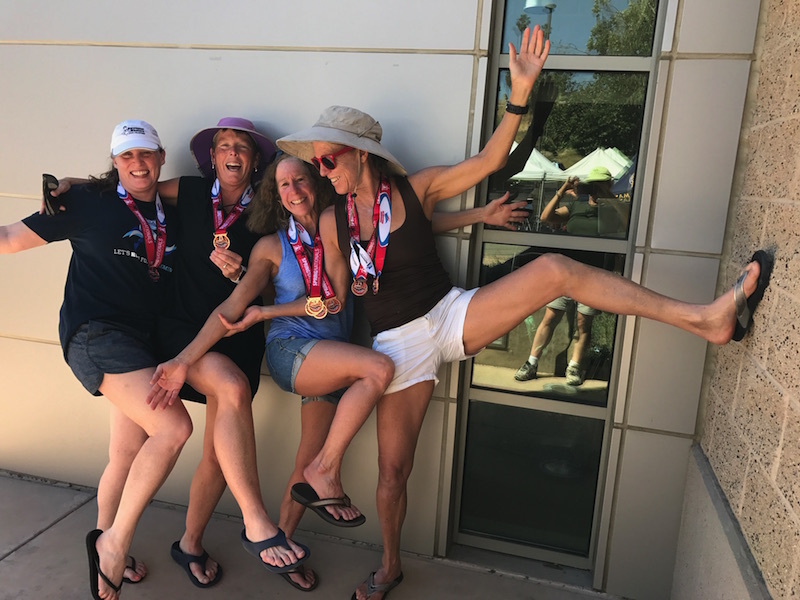 2017 USMS National Championships - Pacific Masters Represents! Over 2,000 swimmers converged in Riverside, California from April 27 - 30 to swim their hearts out at the USMS National Championships. 172 Local Clubs and 17 Regional Clubs were represented at the meet. The meet was held in the Riverside Aquatic Complex pool, which consists of a crystal clear 65-meter pool, divided into two 9 lane 25-yard courses for competition and two 25-yard warm up pools. Pacific Masters was well represented with 350 swimmers from 45 Pacific Masters clubs. 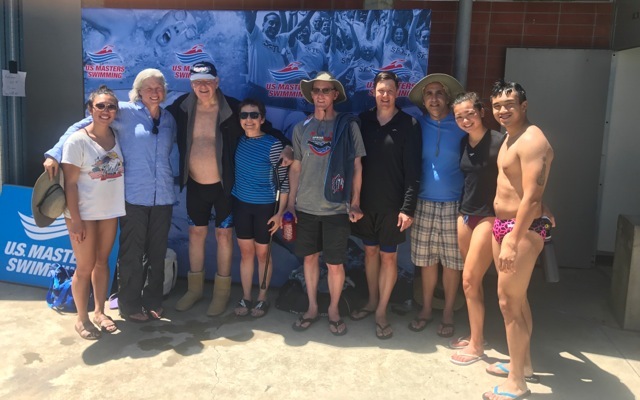 Unlike our Pacific Masters Championships, swimmers experienced a sunny 80 degree meet and got plenty of vitamin D. With blue skies and clear water, there was a lot of fast swimming! Full results of the meet can be found here. While staying hydrated, soaking up the sun and waiting to swim their events, there was a lot of great swimming to cheer on and watch. 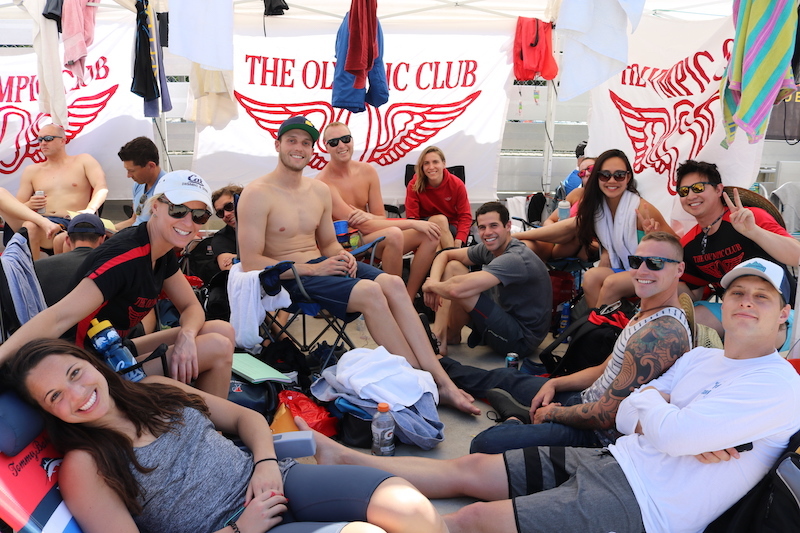 22 Olympians attended the meet, among them Ryan Lochte, Noriko Inada, Jeff Farrell, Rick Colella, and Nathan Adrian (who represented The Olympic Club). Keeping the atmosphere lively and the crowd entertained was our very own announcer, Dave Weirdsma. Thanks, Dave for keeping us informed, awake and entertained. Many National records were demolished by Pacific Master swimmers. Laura Val broke Women 65-69 National records in every single event she swam: 50 back, 100 back, 200 back, 50 free, 100 free, and 100 fly. Jill Hernandez set four new Women 55-59 National records in her events: 200 back, 200 IM, 500 free and 400 IM. Other Pacific Masters’ record setters include Danielle Herrmann (broke the Women 25-29 50 fly and 100 IM), and Andrew McPherson (broke the Men 70-74 100 IM record). Two National relay records were set by Pacific swimmers. 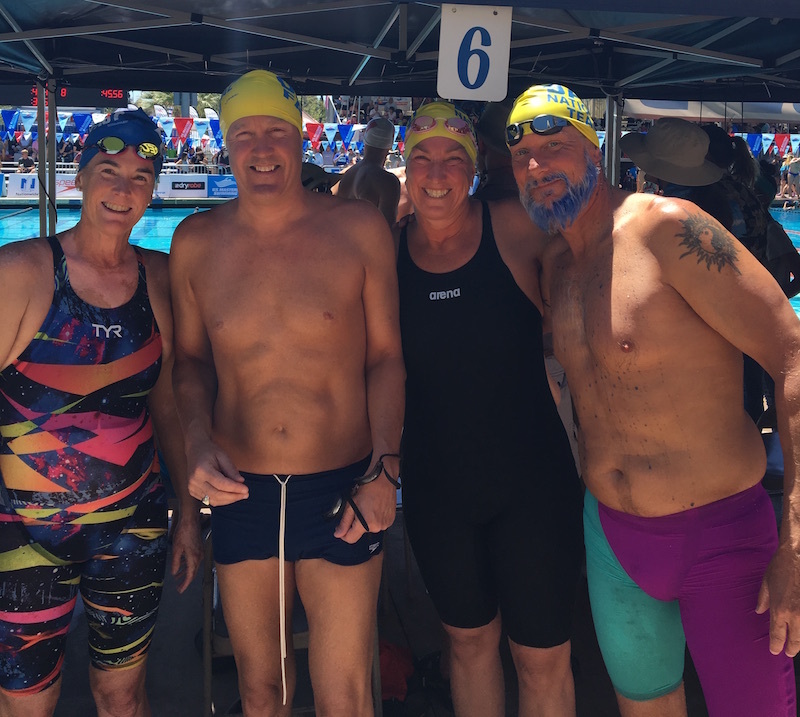 Marie Ballenger, Katherine Raatz, Gary Marshall and Scott Greenwood of the Olympic Club set a new Mixed 25+ 200 Freestyle Relay record, while Tamalpais Aquatic Masters swimmers’ Barbara Hansen, Kristin Jaffe, Eileen Mooney and Nancy Ridout broke the Women 75+ 200 Freestyle Relay record. All the records set at Nationals can be found here. 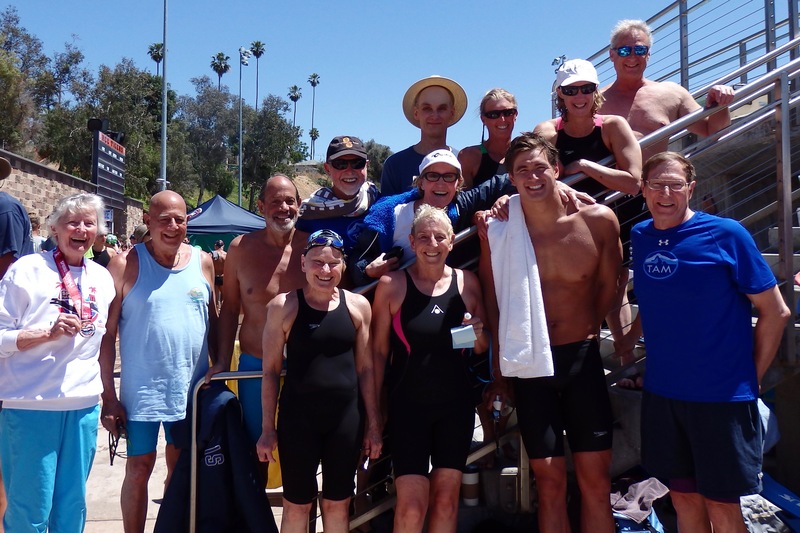 Congratulations to The Olympic Club who placed 1st in the Local Clubs with 1,449.5 points, outscoring 2nd place San Diego Swim Masters by 400 points. Las Vegas Masters finished 3rd with 994.5 points. Other Pacific Masters swimmers represented their teams with pride: Tamalpais Aquatic Masters placed 8th with 729 points, Walnut Creek Masters placed 12th with 493.50 points, Davis Aquatic Masters placed 21st with 294 points, and Santa Cruz Masters placed 22nd with 243 points. All of the team scores can be seen here. Overall, swimmers had great times, greats swims, and made lots of great memories. Congratulations to all swimmers! By Lindsay Gaudinier, Walnut Creek Masters. Additional photo information: top: photo by Naoko Watanabe; 2nd from top: Jane Russell, Sam McAdam, Jennifer Phalen and Doug Smith of Davis Aquatic Masters. Photo by passing swimmer.